HINDRAF Chairman, P. Waytha Moorthy will be in United States from April 1- 13 to meet with NGOs, elected representative and the public in raising issues relating to the systematic marginalization and racism that is escalated through public policies in Malaysia. The issues related and raised will be in every spectrum constituted in the Malaysian constitution such as that in Article 5, 6, 8, 9, 10, 11 & 12. These articles are the very universal tenet of existence of a citizenry and the continued abuse of this by public policies and political power goes unchecked to deprive the non minority Malaysian citizenry to participate, contribute and develop with the growth of the nation. Meeting with elected representative of Congress, House of Representative, State Department and Foreign Affairs select committee & NGOs such as HAF, Amnesty, Human Rights Watch etc. 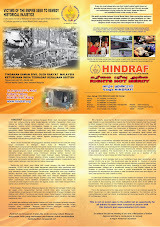 Those minority and effected organization that represent them in Malaysia, who are keen to raise their issues in the HINDRAF’s road show in US, please provide us with substantiated materials and we will try to bring this to light to the public, elected representative and the NGOs in United States during this road show. Civil society groups and other concerned individuals should not be taken in by Education Minister Muhyiddin Yassin's statement that the Interlok issue has been resolved. In fact, not only is it not resolved but compliance will mean that 'Interlok' could well be extended from its present Zone 2 (Klang Valley) coverage thereafter to Zone 1, Zone 3 and Zone 4 in the rest of the country. Success in imposing Interlok will only encourage these ideologues to move further upstream and inject their indoctrination into the syllabus for the younger forms, and eventually in the primary school curriculum. The history and moral subjects have already been tampered with. Currently the focus is on language and literature. What will be next? Muhyiddin's statement that nobody should politicize or exploit the issue by using NGOs is made in wilful ignorance. The fact is these organisations have been in the forefront of the campaign from the outset. It is not difficult for the minister to determine the chronology of events with regard to the emergence and growth of public (but hardly any political) consciousness, concern and agitation on the book. A quick glance at news and reports from the websites will show that civil society organisations such as NIAT, Hartal MSM, and the Centre for Policy Initiatives have provided analysis and public feedback for several months now on the unsuitability of Interlok. The NGO concern is in sharp contrast to the lack of criticism on the book by public figures. Political parties from both Barisan Nasional and the opposition have been slow or reluctant to discuss the appropriateness of the book as a school text. While the education minister and his MCA deputy – the career politicians – have been adamant on its retention, why have the educationists and other Education Ministry officials been largely silent? In NGOs voicing our concerns on key issues affecting our nation, we do not have any political affiliation or political axe to grind. Neither are we racially motivated because Malay and non-Malay, Muslim and non-Muslim groups are equally concerned as to why Interlok is being retained when it is clearly in contravention of the Education Ministry and the Dewan Bahasa dan Pustaka's own guidelines on textbook and literary work. The Minister should welcome our feedback and seek to engage with us rather than try to intimidate us. Giving up on the campaign to have the novel discontinued as a compulsory SPM reading is the wrong message to send. Capitulating to the Ministry's insistence will signal that we do not care for our education system to play a positive role in building social cohesion as is implicit in the 1Malaysia slogan. NGOs and most particularly the parents should continue with even greater urgency and commitment to have Interlok removed from the classroom. The government has might on its side but might does not make it right. Three Selangor Hindu temples: under high tension electric cables forced to relocate next to sewerage pond, forced to Industrial wasteland and given notice to be demolished. All in one day! Only in PKR Selangor! Re: 1) Three Selangor Hindu temples: under high tension electric cables forced to relocate next to sewerage pond, forced to Industrial wasteland and given notice to be demolished. All in one day! 2) 90% or 114 out of 128 hectres land granted to the few Chinese temples in Selangor. But 5,000 hindu temples granted a mere 7.67 hectres. Unlimited land for malay muslim mosques and suraus. We refer to the above mentioned matter and to the news report in Free Malaysia Today 30/3/11, The New Straits Times at page 10 and Makkal Osai on 31 March 2011 at page 10 which directly violates the right to freedom of religion which is entrenched and guaranteed by especially Article 11 of the Federal Constitution. a) Relocation of the 200 year old Mariamman Hindu Temple from Section 19 to a Section 23 Industrial Wasteland . b) Allowing high tension electric cable to be erected and the subsequent forced relocation of the Subang Heights Hindu temple to next to a sewerage pond. To the direct contrary the economic giant and with substantial political power Chinese community was granted 90% or 114 hectres out of the of 128 hectares (approximately 430 acres) non Muslim place of worship land to merely the very few Chinese temples in Selangor. But the estimated 5,000 hindu temples in Selangor were granted a mere 7.67 hectares of state land. And unlimited state land for Malay Muslims suraus and mosques. All by the PKR, DAP and PAS led Selangor State government that had promised non racist and religious extremist government policies against especially the softest targets Indian poor in the prelude to the 2008 General Elections. This is just the tip of iceberg which is documented and reported on a day to day basis in our Website www.humanrightspartymalaysia.com . In order to avoid the aforesaid mode and model of Constitutional violations we ask your goodself to forthwith alienate and grant land titles to all the above mentioned three temples where it is now (in situ) and also to all other Hindu temples in the State of Selangor, and so as to provide a permanent and the long overdue solution to this very basic fundamental freedom of religion Constitutional right. Pursuant to Section 40 of the National Land Code all lands are vested under State Authority. In addition, Section 42(1) of the Code empowers the state Authority to alienate land. Final Land Title pursuant pursuant to Section 85 of the National Land Code shall serve as a conclusive title as per section 89 of the National Land Code. Therefore by virtue of Section 76 (a) (ii) of the National Land Code which provides for alienation of state land for public purposes, we ask that Selangor State government land be alienated to these three hindu temples forthwith and thereafter to all the other 98 tamil schools, all other hindu temples and hindu cemeteries in Selangor accordingly. We would like to bring to your kind attention to the current unjust alienation of land by Selangor State Government for non Muslim places of worship. It was reported that out of the 128 hectares of land allocated, a mere 7.67 hectares of land was allocated for the estimated 5,000 hindu temples in Selangor. And unlimited land for Malay muslim mosques and suraus. This act by the Selangor State Government clearly portrays the mode and model of inequality if not smacking racism and religious supremacy targeted against the defenseless and soft target Indian poor as had been practiced and implemented by the previous UMNO regime. We hereby give notice for your goodselves to furnish us with a list of all Hindu temples, hindu cemeteries and Tamil schools that has been granted Selangor State government land titles in the last three over years and the total number of land titles not yet granted to all the other remaining Tamil schools, hindu temples and hindu cemeteries in Selangor in accordance with the Freedom of Information Act 2010 (Selangor). We thank you for your kind co-operation in this matter. UMNO directs so called “independent” Malay-sian Elections Commission (SPR) to back track on holding “Kursus Pilihanraya” at HRP HQ. HRP goes on irrespective with ex Lunas DAP candidate & ex PKR Pengarah Pilihanraya. This morning we received a phone call from Puan Suharni binti Othman of SPR that the entire SPR elections officers would be in Sarawak and that they would not be able to send their Tuan Haji Abdul Halim bin Ab Rahman or any other Elections Officer to the HRP HQ Kursus Pilihanraya (elections course) on 10/4/11 as per the SPRs’ earlier letter of confirmation dated 28/3/2011. (see below). P. Uthayakumar asked why so and not even one out of the hundreds of Election Officers and especially with the tens of millions of Ringgit Malaysia annual budget for SPR vis a vis Democracy. Puan Suharni repeated that all the officers would be in Sarawak she said that she would confer with the SPR Secretary Datuk Kamaruddin Mohamed Baria and revert to us. P. Uthayakumar replied that the HRP motto was “Rights not Mercy” and would therefore not beg and would leave it to SPR. We were not surprised when at about 5.00p.m this evening we received the SPR letter (see below) that none of their officers would come to the HRP HQ Kursus Pilihanraya. This is not the first time something like this is happening. Some months ago the National registration Department similarly backtracked from attending the Identity Card & Birth Certificate registration programme at the HRP Penang HQ on UMNOs’ similar instructions, after reading the news of the same at this our HRP website. And it is this very same Kamaruddin Baria, who was the then Secretary of the so called ‘independent” Malaysian Human Rights Commission of Malay-sia (Suhakam) which refused to hold an Inquiry into the UMNO state sponsored Kampong Medan racial attacks targeted against the Indian poor from 8/3/01 to 21/3/01 where five Indian poor were murdered and 100 over others were caused grievous bodily injuries. Thereafter we had refused to recognize or deal with Suhakam ever again right up to this date. And today history repeats itself under this very same racist UMNO regime’s “independent” SPR.